One drawback of removing PulseAudio in Ubuntu is that you’ll no longer be able to use the audio icon on the notification area (‘sound indicator’) for quickly accesing the mixer settings and applications that support it. As a result, whenever you want to mute or increase/decrease the audio levels or configure other advanced settings in ALSA, first you have to open its tool (‘alsa-mixer’) by clicking on the Dash etc … it can be hectic. So if you’re looking for a utility that gives you quick access to your Sound card through ALSA by using a system tray area icon then ‘QasMixer’ is a new and an awesome looking tool that you might wanna try. Though of course it cannot give you the features of the ‘Sound indicator’ (such as controlling ‘Rthythmbox’ for instance) but heck, it makes is easy to control ALSA. The below screenshot is for my Conexant CX20671 chip, but depending on the features of your sound card the amount of controllers will change. You can up/down the volume, lists the current volume levels (dB), mute/unmute individual channels and change microphone volume gain settings etc from this main window. You can also change sensitivity of the sliders, change the mixer device, enable/disable the system tray icon etc using the ‘Settings’ section as well. When you click on the system tray icon you’re taken into the Mixer window rather than giving you the ability to quickly raise or lower the volume (like PulseAudio indicator does). If the developers could implement something like that it should bring smiles to a lot of peoples’ faces ;-). This is actually one of the tools that belongs to a project called ‘QasTools which gives you two other utilities for configuring ALSA. Anyhow, currently it’s only available for Ubuntu 12.04 Precise Pangolin and 12.10 Quantal Quetzal, so if you use one of those versions and craving for an ALSA system tray icon, then enter the below command in your Terminal to install it. 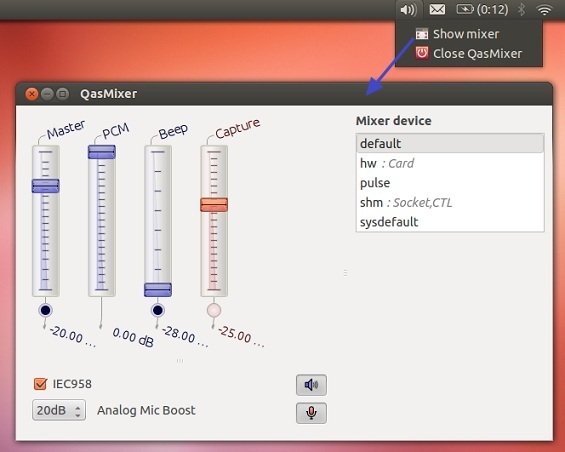 By default ‘QasMixer’ does not load on your system start-up hence you’ll have to manually open it to get the system tray icon. However, we can easily add it to the desktop start-up as a solution. For that, follow the below steps. Step 1: Click on the small ‘gear’ icon on the right top corner in Ubuntu and from the menu choose ‘Startup Applications…’ as shown below. Step 2: Then from the next window, click the ‘Add’ button to add a new one. Step 3: You can enter any name (I’m using ‘Tray icon for ALSA’) and for the command enter the below one. Adding a comment is optional. When done click on the ‘Save’ button and close the window. Now reboot your computer and ‘QasMixer’ should load its system tray icon automatically. That’s it!.